I’m suggesting we put a different spin on the phrase “Love Letters.” With Valentines Day approaching I challenge you to find time each day during the month of February to write “Letters” with your child. Children don’t see us actually writing as often as kids used to “in the old days.” By focusing on writing with your child each day it may spur some interest (dare I even say excitement?) for letters and writing. Don’t stress it! Don’t make this a chore. If your child writes a little – Great! If he or she really gets into it – Great! The idea is to expose children to the idea that thoughts can be written down. Others can read our thoughts after we write them. Have some fun! I will be posting quite often this month. I’ll have posts about love and showing love. I’ll have links to silly things as well as touching moments. I will also be checking in with you throughout the month to see how you are doing on the “Love Letters” challenge. I will post photos of pages children are writing here at school. Here is one to get us started. See, it doesn’t have to be anything fancy. We would love it if you could also post some photos of the “letters” you are writing at home in your comments. People I love – make a list. Food I love – make a list and then cut out pictures from the newspaper. I love to . . . . leave this one open ended. 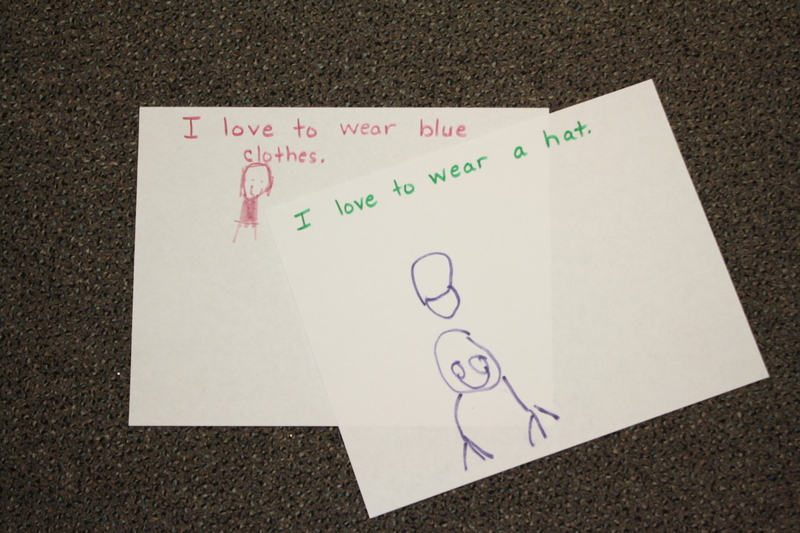 Encourage your child to draw about what he or she said. I love the color _____________. Color or write on the page with that color. FYI – Crayons help strengthen muscles more than markers. 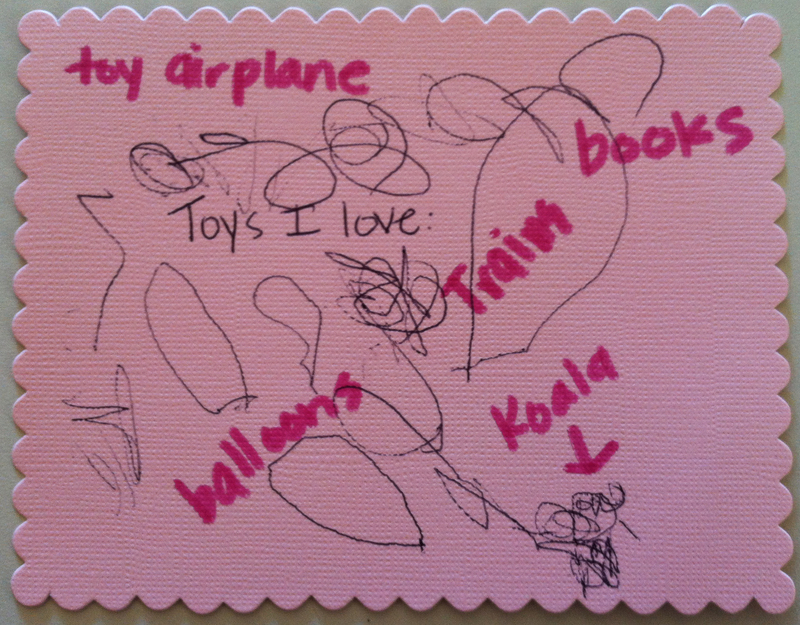 My toys I love – make a list. Take a picture of your child playing with a favorite toy. I love to help people by … help your child come up with ways he or she can be helpful. Ways I love to move: Hop, jump, climb, crawl, DANCE? Put some fun music on and get your groove on! I love when our family ___________________. Draw a picture of the activity. I love to go to __________. If you can, find a picture of this spot on the internet and print it for your child to paste on the page. Or, help him or her write the letters of the place and see how he can draw it. I love to ______________ before I go to bed at night. I love to give (or donate) ______________________. I love to hear ____________________________. I love to see _______________________________. I love to visit _______________________________. I love to smell _____________________________. I love to touch (or feel) _____________________. I love to share ____________________________. I love to go to ________________________. I love to wear ________________________. I love to read these books – make a list. I love to ride on ______________________. Love notes – Make a “mailbox” – sometimes they have these for a $1 at Target – for each person in the family. Heros I love – make a list. I love to watch ________________________. At the playground I love __________________. I love to sing ______________________. Outside I love to _____________________. At school I love _______________________. I love to learn about – make a list. I love to go shopping at ____________________. I love to help _________ at school by _________________. I love to cook _______________________. What I love about (Grandma, my family, my sister/brother, etc.) You could do this on multiple days. Purchase a set of valentines and just write your names and give them to neighbors, friends, each family member, etc. Remember – have fun! While you are at it you may just learn a little about that special little one in your home. Categories: Child Development, literacy | Permalink. With the winter weather clearly upon us we can begin to dread the long months of January and February. We know there are probably many days that we will all be cooped up inside. The kids’ activity level seems to grow exponentially with the number of days kept inside. Hopefully a few of these activities will fill some of the time and expend some of that energy. Puzzle pieces – Someone hide all the pieces to a puzzle and then the others try to find them and put the puzzle back together. For those that like a little more excitement you could set a timer to see if you could beat the buzzer. Socks – Gather different pairs of socks and again, someone hides one of each pair and then the other people try to find the matches. Bubble wrap – Often times you have some bubble wrap left from deliveries, etc. Make a road of bubble wrap to walk on or drive cars on. Shaving cream – This is fun just on it’s own but add some wood blocks or cars and it really changes the play. Nature Scenes – In a large shallow plastic bin gather items that would create a nature scene. Rocks, blue socks as a pond, brocolli trees?, or forks as winter trees … If you want to take a quick trip to Hobby Lobby you could pick up a package of the wood slices, gravel, etc. Add some small animals and let the imagination begin (well, hopefully it has already begun as you were trying to find items for the scene.) Here is a photo of one from The Imagination Tree blog. For more ideas just type in nature scene play into the search field on Pinterest. Do the kids want a snowy scene? Try adding some snow with this recipe from the blog, Frugal Fun 4 Boys. Sled Pull – Well not outside right now (It’s toooo cold!) But, can you find items in the house to represent a sled (perhaps the laundry basket) and then find ways for it to be pulled (maybe a belt looped through the holes?) Our Red class had a child on a scooter with another child standing in a hoop. The “reindeer” pulled the sleigh around. The sled could hold real people or possibly stuffed animals. Obstacle course – Our Blue class had different stations today in large motor: (egg carrying, launch boards, and bean bags through hoops.) How could you make stations or a course that children could repeat over and over. Couch cushions make a great swamp to walk through. Tables draped with a sheet make a great tunnel to crawl through. Wadded up paper and large bowls make a great throwing option. Sticky webs – The wadded up paper reminded me of this wonderful activity found on Hands On As We Grow blog. Check it out by clicking on the photo below. Still looking for ideas? Our Aldersgate Preschool site on Pinterest has a board specifically for inside play ideas. You may want to see the ideas there. Check back in at times to see if I’ve added some new ideas. I’m so excited! We have another guest blogger. Jen Anderson is a longtime parent at Aldersgate. She is also our current Personnel Chair on the Aldersgate Preschool Board. I was making dinner one night and gave my kids some new markers and asked them to draw a picture for Grandma and Grandpa that we would mail to them. “Success!” I thought to myself as all three kids started working without a fight and I started dinner. After a few minutes, my six-year-old asked me if I liked his picture. “Yep, looks great!” I quickly responded as I knew my time for peace was running short. As he continued describing each item in his picture, I responded with a vague, “looks good”, “great idea”, “good color”. As I continued to cut the apples (who am I kidding, this was not a gourmet meal! ), I suddenly had a quick flashback to one of the Aldersgate teachers I had seen recently during the class work time. She was preparing art materials for the next activity when a child came up to tell her a story. She stopped what she was doing, got down on the level of the child, and had a glowing smile on her face as the child explained, in detail, a story about her weekend. As I watched, the teacher gave her complete attention to the child and one may have thought it was the most interesting story of all time as she responded to the child and asked specific questions. After the (long!) story ended, the girl turned and went back to play. Then, the teacher returned to art setup. I knew this Aldersgate teacher had other things to do; but she gave the child undivided attention. I put down the apples and went to sit by my son. He had a huge smile on his face as he explained every detail of his picture. As I listened to his story about the picture, I realized my attentiveness to his story was much more important for those three minutes than my dinner prep. Thanks Jen! As a follow up to Jen’s wonderful blog post, I came across this article that talks about a parent’s presence in another way. For those who love to ponder all sides of an idea here is another interesting article: Your Presence is Enough.